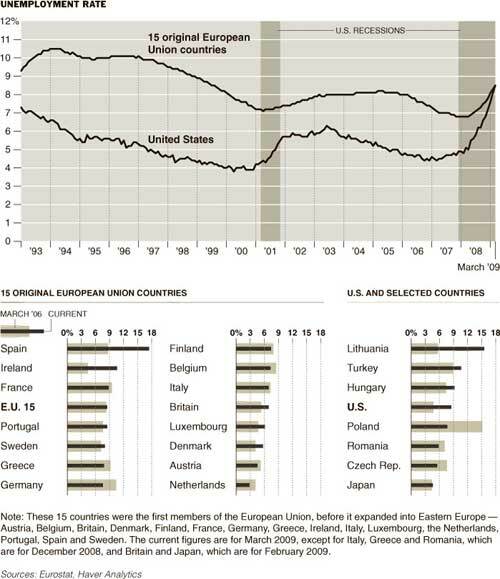 In Saturday’s New York Times, Flloyd Norris points out that the jobless rate in the U.S. has risen to European averages, and will likely pass them when international data for April is calculated. From NYT: FOR many years, unemployment in the United States was lower than in Western Europe, a fact often cited by people who argued that the flexibility inherent in the American system — it is easier to both hire and fire workers than in many European countries — produced more jobs. That is no longer the case…. In March, the American unemployment rate stood at 8.5 percent, the same as the average rate for the first 15 members of the European Union. In April, the rate in the United States rose to 8.9 percent. When the European figures are compiled, it seems likely that the American rate will be higher for the first time since Eurostat [the European Union’s statistical agency] began compiling the numbers in 1993. So I guess I’ll add my 2c to the speculation. While the probability the U.S.’ unemployment rate could rise above Europe’s, in the short-run, is relatively high, it is also possible to see larger increases in European unemployment levels as the global contraction drags on. So far, the story of this global downturn is that Europe has somewhat lagged the US.